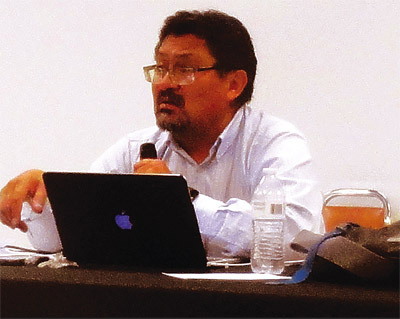 In an effort to learn more about discrimination in the Montezuma-Cortez public school systems the Navajo Nation Human Rights Commission invited Native students and parents to a hearing in Cortez. It was one of nine hearings held in border towns surrounding the Navajo Nation, including Cuba, Albuquerque, Gallup, Holbrook, Winslow, Flagstaff, Page, Blanding, and Farmington. Leonard Gorman, director of the Navajo Nation Human Rights Commission, listens to testimony during a hearing on race relations in the public schools. The Cortez meeting was one of nine held in border towns around the perimeter of the Navajo Nation in March. Photo by Sonja Horoshko. Testifying before the commission opens the door for individuals to tell their stories to a sanctioned entity where they can seek authoritative advice, air the complaint and possibly seek further legal help. This is the first step to identifying issues that may otherwise go unnoticed or be dismissed as inconsequential by officials in border towns. Predatory lending, voters rights, funerary practices, racism in the schools or other institutions are all topics of interest to the HRC. “I’m a historian,” Jennefer Denetdale, NNHRC chair, said. “I understand the link between the poor infrastructure on the Navajo Nation and how it accounts for more dependence on border towns. Of students enrolled in the Montezuma-Cortez RE-1 School District, 26 percent are native, 20 percent Hispanic, 49.5 white and 4.5 other ethnic groups. The native population is split evenly between the Navajo and Ute Mountain Ute tribal affiliations. Cortez resident Art Neskahai, Diné chairperson of Southwest Intertribal Voice, spoke at the hearing about his experience when his children began attending schools here in 2001. When he enrolled his children, they were immediately placed in the Individualized Education Plan without his consultation, he said. Today, the RE-1 district reaches out to Native parents with multiple efforts designed to strengthen resources for native families. The Indian Policy and Procedures Presentation, a document produced every year, is found on the RE-1 website by its acronym, IPP DATA Presentation. It’s the place where parents can find facts about how native students, identified as Navajo or Ute in the graphs, are performing in language arts and mathematics. It is very accessible, showing bar graphs with text for all grade levels, and compares the current year to two previous years. Trends in performance levels are clearly visible. Opportunities for parents to engage directly with the school in matters regarding their child’s education are offered through the Communication Support Committee and the Parent Advisory Committee for Parents of Indian Students. 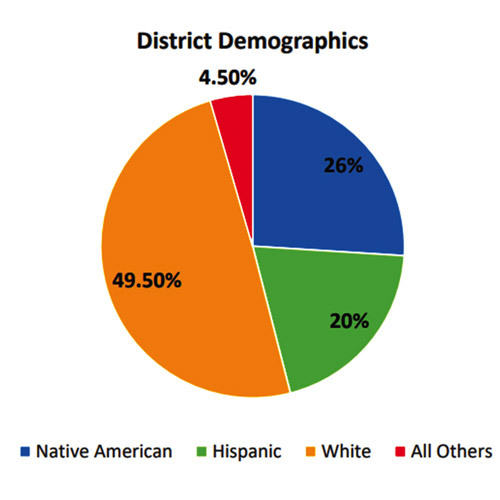 This graph shows demographics of students in the Montezuma Cortez Re-1 School District. While parents are encouraged to attend the monthly board meetings they are also invited to participate in the spring Parent Accountability Committee for parents of Indian Children, where their input and the needs of the native students can be discussed with administrators and teachers. In addition, the IPP document outlines mechanisms of support offered by the school district that ensure inclusive cultural identity and awareness programs are available to all students in all grade levels. The Native American Club provides access to off-campus cultural events, brings cultural programming to the schools and continues to support students attending the national American Indian Science and Engineering conference each year. The IPP document is very comprehensive. It provides a lengthy amount of detailed information in a clear and concise format and it is easy to access online. Although the Cortez meeting was sparsely attended, one parent drove from Durango to talk with the commission about the curriculum at her daughter’s middle school, which does not include native history, or a cultural point of view. No hearing was held in Durango because it doesn’t adjoin the Navajo reservation. “My daughter is disengaged,” she said, explaining that the gap in presenting historical diversity hinders her daughter’s progress and self-esteem. Denetdale suggested she consider filing a formal complaint with the NNHRC. There will be more investiga tion into the use of funds if she includes a specific incident about funding in the filing. Each hearing has drawn complaints about the lack of native curriculum and cultural sensitivity in the classrooms, the commissioners said. The commission set aside other engagements during the current fiscal year to focus on these concerns as a result of an incident in Cibola High School in Albuquerque, N.M., when a teacher was placed on leave for allegedly making a culturally insensitive remark to a student and snipping another student’s hair. “Clearly cutting a student’s hair was an assault, a physical assault on a student,” said Denetdale in her opening remarks. It happened during a Halloween celebration at the school in late October 2018. The ACLU has now filed a lawsuit on behalf of the student’s family. Gorman reiterated that the schools everywhere need to not just talk “about” natives and offer extracurricular activities, but actually “recognize various aspects of our cultures, teach cultural values and language equally in the curriculum. Years ago the Human Rights Commission made great progress working with the school system in Southern Utah, Gorman said. “It was good work and now it has slipped. Those good works have to be renewed again. The system reverted to its old ways. We let our guard down. We have to rekindle our concern. We have to ask how Indians are being treated in all schools, including Navajo Nation, Bureau of Indian Education, public, private and parochial. “We have been to Cortez several times for hearings on this and other topics and hope to foster a good relationship and communication with the school system. For more information on the Navajo Nation Human Rights Commission and how to file a complaint visit their website, www.nnhrc. navajo-nsn.gov or call 928-871-7436. The Navajo Nation Human Rights Commission is located in St. Michaels, Navajo Nation ( Arizona).